The Hedge Spider is a type of mob which spawns exclusively within the Hedge Maze from its respective spawner. 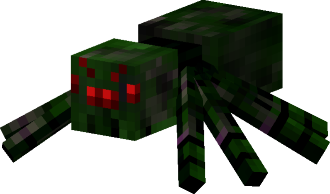 The Hedge Spider is identical to the Spider from vanilla Minecraft in every respect except for its appearance and where it spawns. Hedge Spiders can spawn in broad daylight and can only spawn from a Hedge Spider spawner. Hedge Spiders cannot spawn naturally by vanilla spawning mechanics. Hedge Spiders have a green appearance whereas regular Spiders have a more brown appearance. Hedge Spiders have the same amount of health, deal the same amount of damage and drop the same items in the same quantities. Hedge Spiders can also climb walls and do so with the same AI that regular Spiders use to climb walls.